In preparation for compliance certification later this year, we disabled write access for all AWS console users (except the primary, more on that later) to streamline infrastructure change management. 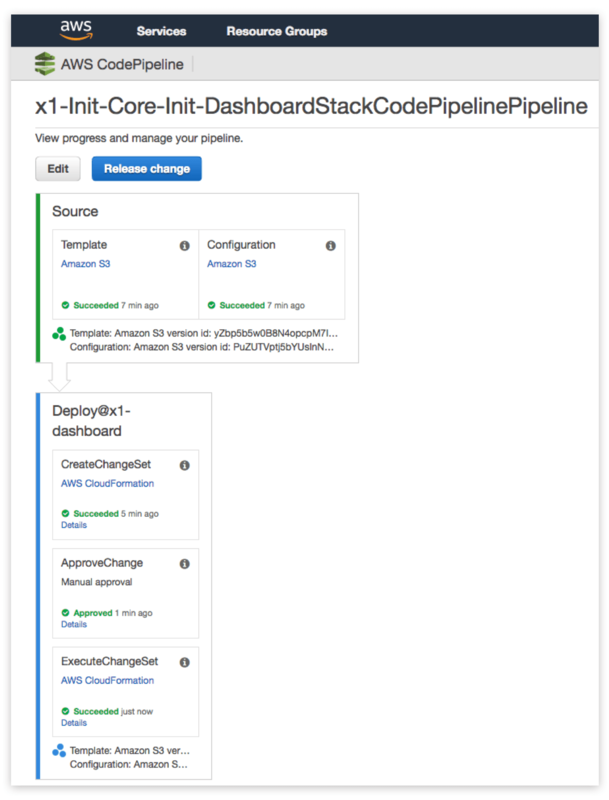 This post describes how we created a self enforcing, self documenting infrastructure change management system using Git, CodePipeline and CloudFormation. CloudFormation provides a way to describe AWS resources in simple text. It’s used for provisioning and managing all AWS resources (VPC, routing, subnets, LaunchConfigurations AutoScaling Groups etc) that are required for running your application/workload. Any decent CloudFormation codebase is broken into multiple stacks. With each stack being responsible for one specific function (network, database, service A, service B) and represented by a single template file. 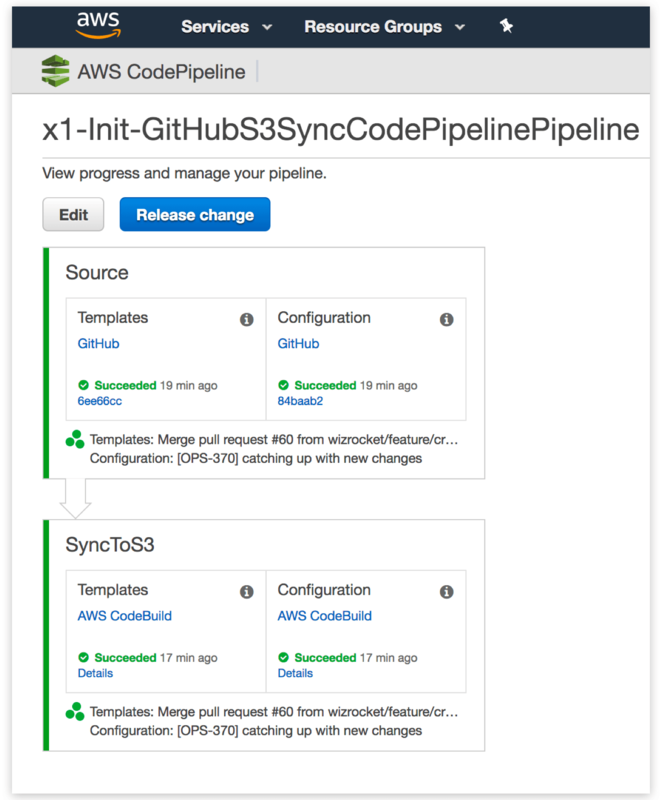 We modelled one CodePipeline pipeline per CloudFormation stack. This provides the ability to execute updates to CloudFormation stacks in any order we deem necessary. - echo "Fetch existing template files from s3"
- echo "Comparing and pushing updated files"
- echo "Cleaning up deleted files using reverse lookup"
- echo "S3 file sync completed"
Each CodePipeline pipeline is mapped to one single stack. There are two sources for the pipeline – the template and the configuration. When a change in either of the sources is detected, the pipeline begins executing. It creates a CloudFormation changeset and notifies everyone that a changeset is awaiting review. Upon manual review of the changeset a user with IAM permission codepipeline:PutApprovalResult approves it. Upon approval, the changeset is executed. We have a stack that provisions CodePipeline pipelines. These pipelines provision and manage other stacks. Yes, that sounds twisted – read it once again to wrap your head around it. This is our version of infrastructure init. Once provisioned by hand, it’s capable of provisioning all the CloudFormation stacks we need to run and manage our platform. We have multiple, 100% isolated, independent production environments deployed across various AWS regions. The change management process begins with a branch being created for a change. This branch is tested independently by the person working on it, in his/her development AWS account owned by CleverTap. Once the change is verified in development, a pull request to merge it into develop is raised. Develop is locked using GitHub’s branch protection rules. A merge into develop requires at least one review and can only be merged by the repository owners. This is where a peer review happens and is signed off by the repository owner(s). From develop, it’s merged into master by the repository owner(s). Once in master, the CodePipeline pipeline that is watching the repository detects the change and begins executing. This causes the files that changed in master to get updated in S3. When files in S3 are updated, the pipeline(s) watching it begin executing causing the creation of a changeset and notifying everyone via email that a change needs approval before being executed. The changeset is once again reviewed by the repository owner in our case and executed by any team member during environment maintenance hours. Assuming no one other than the root AWS account has write access, this change management process is self-enforcing. There is no way anyone can change the state of infrastructure without following the process. Although we don’t have a use case for it, another interesting possibility is to require two different people to approve before the pipeline continues and applies the changeset. In the opening statement, I said that we disabled write access for everyone with the root account being the exception. That’s not 100% true. Operations and engineering IAM accounts have the ability to stop, start an instance, invalidate CloudFront cache and execute/approve build pipelines. These write actions are operational requirements. They do not change the configuration of deployed infrastructure. A way to disable automatic execution on pipeline provisioning. RestartExecutionOnUpdate applies to updates to an existing pipeline. I understand it’s neat to automatically begin execution on provisioning, because – after all, the pipeline is meant to magically deploy software to its destination. But there are cases, especially when deploying to CloudFormation where you want to control the first time execution of a pipeline. Git source integration with providers other than GitHub, Amazon CodeCommit or S3. Git over SSH to user-defined git repositories perhaps. Support for IAM action ListAllMyPipelines similar to S3 action ListAllMyBuckets. This will limit the pipeline listing to only the pipelines that user has access to. Search should match pipelines that contain the searched text within the name of the pipeline. Add the ability to specify a stack update policy separately from TemplateConfiguration. Access to the repository that holds template configuration is available to a larger audience. Update policy which controls stack protection information should be protected separately. Speed up pipeline stage transition and action execution updates in the UI. Overall, pipeline UI updates and pipeline execution speed needs to improvement. If a pipeline is configured with multiple sources and changes to more than one source is detected during a poll interval, don’t execute the pipeline for each source change. Instead, understand that multiple sources have changed and incorporate the changes from all the sources in the next pipeline execution. Support Stop or Cancel during a pipeline execution. This can currently be achieved by rejecting an approval stage. But, there is a difference between Reject and Stopped or Cancelled. Show the execution ID of the pipeline that is currently running in the pipeline UI. Show last execution start and end datetime on the pipeline listing page in the console. Show current status (In Progress, Failed, Succeeded) on the pipeline listing page in the console. We will lobby for our wish list with AWS and hopefully some if not all of the items on the list see the light of day.